Nana holds an Honorary Doctorate Degree from the Dayspring University in the United States of America and an EMBA (Financial Management) from the GIMPA Business School. Nana Dr. Appiagyei Dankawoso I is Okyeame to Nana Otuo Siriboe II, Omanhene of Juaben Traditional Area. Nana joined the Board in 2008 and chairs the Finance/Administration and Human Resource Committee of the Board. Nana is the Managing Director of the Marine and General Insurance Brokers Ltd.He is also the 2nd Vice President of the Ghana National Chamber of Commerce and Industry. Nana also serves on other Boards including the University of Ghana Business School (Legon), University of Cape Coast Business School, West African Examination Council (WAEC) Accra. 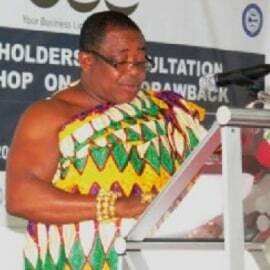 Nana has led various business delegations on behalf of the Ghana Chamber of Commerce and Industry to Abuga-Nigeria, Belgium, China, India, Geneva-Switzerland, Treviso and Torino all in Italy and California-USA.